On January 17, 2019 local time, Special Representative of President Xi Jinping, Member of the Political Bureau of the Central Committee of the Communist Party of China (CPC) and Director of the Office of the Foreign Affairs Commission of the CPC Central Committee Yang Jiechi met with President Teodoro Obiang Nguema Mbasogo of Equatorial Guinea in Malabo. Yang Jiechi conveyed President Xi Jinping's warm greetings to Teodoro Obiang Nguema Mbasogo. Yang Jiechi expressed that China-Equatorial Guinea friendship enjoys a long history and has become ever firmer as time goes by. During the Beijing Summit of the Forum on China-Africa Cooperation (FOCAC) last year, President Xi Jinping and Mr. President held a fruitful meeting, reaching important consensus on developing bilateral relations. As President Xi Jinping's Special Representative, I visited Equatorial Guinea with the aim of strengthening communication and deepening integration with the Equatorial Guinean side in well implementing the important consensus of the two heads of state and the results of the FOCAC Beijing Summit. Yang Jiechi stated that the Chinese side will continuously follow the principle of sincerity, real results, affinity and good faith and the values of friendship, justice and shared interests put forward by President Xi Jinping, deepen exchanges of experience in state governance and administration and continue to support each other on issues concerning respective core interests with the Equatorial Guinean side. The Chinese side is willing to enhance bilateral practical cooperation in combination of promoting the construction of the Belt and Road Initiative and implementing the eight major initiatives of the FOCAC Beijing Summit, and assist Equatorial Guinea's economic diversification strategy, so as to bring benefits to the people of Equatorial Guinea and push bilateral comprehensive cooperative partnership to new highs. Teodoro Obiang Nguema Mbasogo asked Yang Jiechi to convey his sincere greetings to President Xi Jinping. 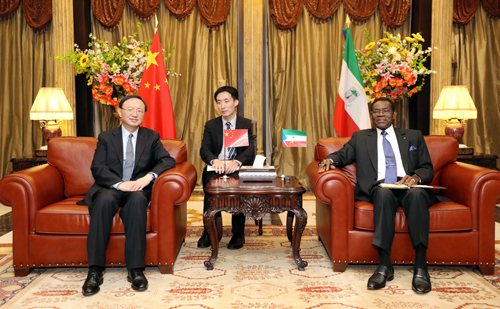 Teodoro Obiang Nguema Mbasogo said that China is an important cooperative partner of Equatorial Guinea. The Equatorial Guinean side appreciates the Chinese side's long-term and strong support and assistance, welcomes more Chinese enterprises to invest and start business in Equatorial Guinea, and is ready to further reinforce mutually beneficial cooperation with the Chinese side in jointly building the Belt and Road Initiative and implementing the eight major initiatives. The Equatorial Guinean side will continuously enhance communication and coordination with the Chinese side on international and regional affairs. On the same day, Yang Jiechi also met with Minister of Foreign Affairs and International Cooperation Simeón Oyono Esono Angue of Equatorial Guinea.